We are Rich and Jo from England, we found out CCDO in Cambodia for our volunteer with English Teaching to CCDO Free English Class at Phum Steung Primary school. We have had a great experience doing my project. I feel we have made a difference too many people in Cambodia very difference to the people in England. The project was developing throughout the time I spent here and I found the CCDO’s staff was open to any new ideas I had. I was very interested to see that CCDO try to work with the regional health authority to ensure that the work they are doing is of the most benefit to the most people. I was given the opportunity to attend with the CCDO Free English Class (Phum Steung Primary school) which was very interesting to teach them with my experiences. I have found the CCDO’s staff to be very welcoming and it has been great fun. My name is Stephanie Reitschuh from Germany, I am 23 years old and I began to study social pedagogy in the University of Applied Sciences in Regensburg, two years ago. Before I had a professional training as medical secretary and assistance and worked for five years. One of my main tasks was working with children and pregnant women in the maternity and children´s department of a large clinic in Regensburg. During those five years I gained a lot of medical knowledge. I spent 2 weeks volunteer in Cambodia at the Ampil Clinic to help and meet the patients in this rural area and teach some health care lessons at CCDO’s Free English Schools( Tapang and Phum Steung). I am very happy with the Cambodia people and students they are very friendly and helpful.I found out the CCDO's Clean Water Well Project is very useful to the poor family at the rural area in Siem Reap province. I wish I can go again! Hello, my name’s Jinwoo Choi. I’m a professor at Hanyang University in Seoul, Korea. I heard that children in Cambodia are very good and hard – working so that I have wanted to meet you for very long time. I am very glad to have time with you and I would thank you all greeting us with such warmness and our students are very happy with this volunteer in English Teaching both two schools( Tapang and Phum Steung Primary schools). We spent great time with you guys and found that you are the Cambodia. Study hard, learn a lot, and be good students. Future will be yours. I wish we meet again in the future. I will remember your bright smiles forever. We are from Hanyang University in Seoul, Korea. We are really glad to be here and share our English experience to Cambodian students through CCDO. We had prepared a lot of things for you, and we really hope you all enjoyed them. All of you are so cute and so smart! You all know many English words. Please study hard and make your dreams come true! Hope we meet you again. 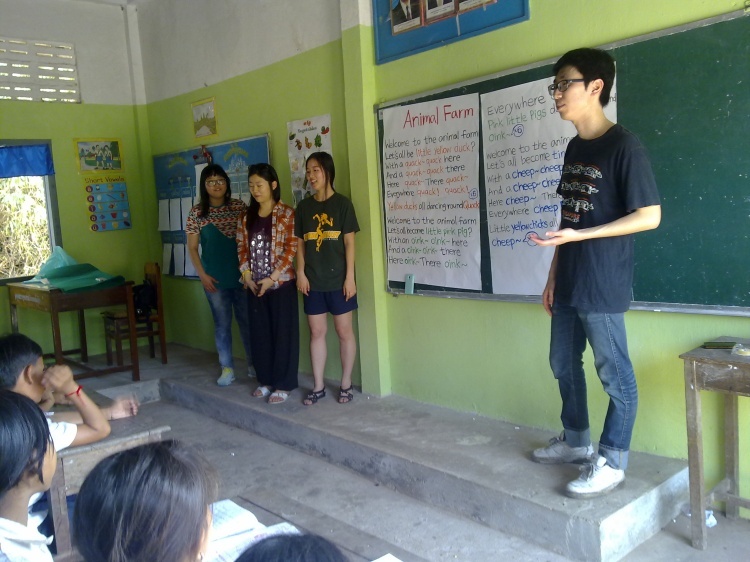 My name is Shaun Lim, I was part of a team from Saint Andrews Junior College in Singapore which participated in a project during November-December 2010, which helped built a library at Tapang Primary school. It was so wonderful for me to see the students at the countrysside and play with small kids, they are very friendly and look so lovely to me and all of my team.I really love cambodia :) the people are very kind and friendly! Like you and the other staff of CCDO. Firstly, I am very happy about Tapang Primary school and with the Library Building Project , Clean Water Well Project and with our English Teaching Volunteer to all the students. The project has made me very interested in helping the children in cambodia and hence I would like to know if there is any opportunity for me to help out in similar projects. I'm very keen in going to Cambodia again. I miss Cambodian! The homestay ! The owners of the homestay that cook good food for us!